Congazuma is a boss in DK: King of Swing. During the events of the game, Congazuma ends up obtaining a golden medal stolen by King K. Rool, who had dropped the medal. 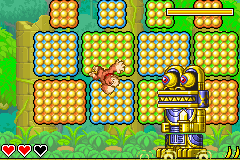 Finding Congazuma in some hidden jungle ruins in the Jungle World, Donkey Kong engages the living monolith in battle for the medal. The name Congazuma is derived from the Aztec ruler, Montezuma. Conzaguma is fought in the Congazuma's Castle level, a wide area full of many peg boards. It tries to jump around and bash Donkey Kong, hurting the ape when it touches him. However, if Donkey Kong smashes the enemy, which can be done with the basic attack done by holding and and then releasing, he can damage it, causing Congazuma to flash red, jump around quicker, and become invincible. The invincibility wears off after a few seconds, allowing DK to hit him again. After the foe is hit four times, it is defeated. Donkey Kong can then claim the medal Congazuma was once guarding from the stony remains of the Kremling golem and progresses to the Wild West World. If Congazuma is defeated an additional time after this, Donkey Kong receives many bananas instead of a medal. This page was last edited on March 31, 2019, at 03:16.